Tidbit jumps rope with the girls. My first camping adventure with my dog Tidbit turned into a lost and found nightmare! How might you feel if you lost your new puppy while camping? 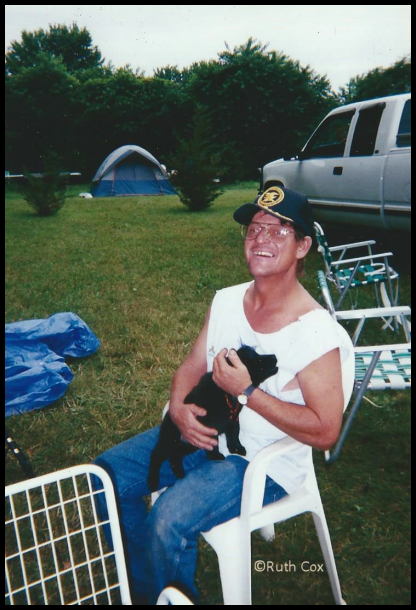 I can imagine that you would feel just like I did when I lost my dog Tidbit at our family reunion camping trip! 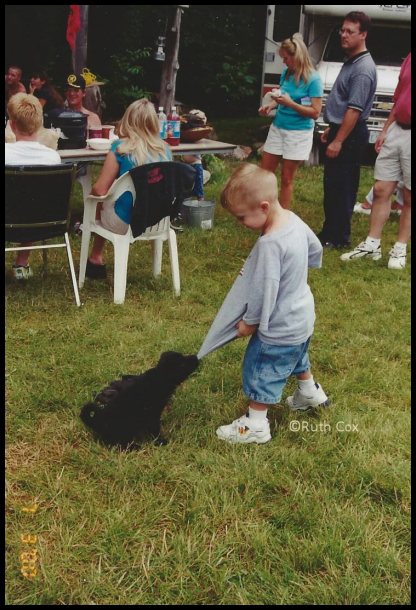 A couple of weeks after Tidbit became the newest addition to my home, it was time for my family reunion—a ten day camping trip on a five-acre plot of land owned by my Aunt Helen. It was tent city, with about fifty of us camped out in the clearing near the woods. Tidbit finds herself a chew toy. At first I watched my little one closely, then realized the other dogs were friendly to Tidbit, even protective of her, the kids were playing with her, and adults were keeping an eye on her. So I settled down to visiting with relatives while Tidbit ran around, just glancing in her direction every now and then. Then it happened—I couldn't find Tidbit! I was panic stricken. Soon, everyone was scouring the land, the wooded areas, looking everywhere for her, just as concerned as I was. Of course, nearly an hour into the search I was in tears and mad at myself for not leashing her up for her own protection. My poor little girl was lost and I just knew it was all my fault! Tidbit asleep at our tent door. Then I heard my brother Ronnie shouting my name. He had found her! 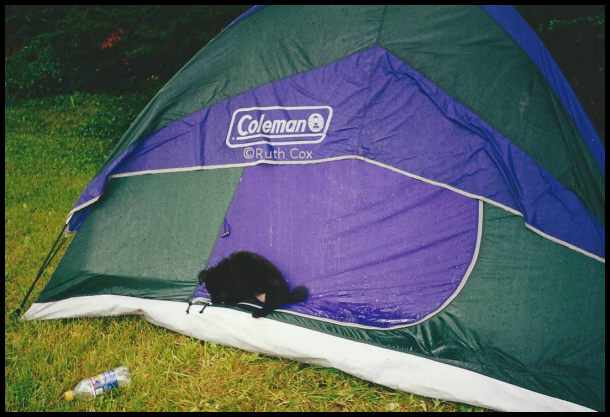 There was Tidbit, asleep in the doorway of my tent! Ronnie picked her up, loved on her a bit, then handed her to me. Now I was crying again, but this time tears of joy. You could see where Tidbit had clawed at the tent to get inside, but I'd zipped it closed and she couldn't get in. Poor little puppy was exhausted from all the activity and just wanted to take a nap. With a dozen or more tents and campers on the property, it was amazing how Tidbit's natural instincts had led her straight to her tent by its scent. 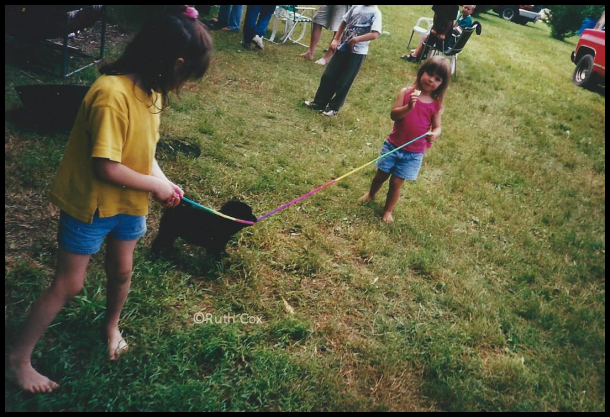 Perhaps that was my first lesson in trusting my dog's lead. Tidbit and her buddy Ronnie. For the rest of the day, if (and that's a big IF) I let Tidbit out of my arms and down on the ground, I didn't take my eyes off of that pup! Fortunately, Tidbit had taken a liking to Ronnie for finding her, I guess, so most of the time if she wasn't with me then she was with him. The next day, Ronnie accompanied a group driving into to town for a grocery store run. When they returned, my brother had a gift for Tidbit. 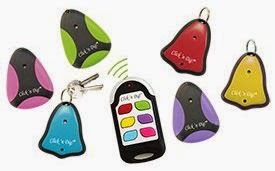 Ronnie had ran into the hardware store in town and found a key finder to help us keep track of the puppy! After we tested the gadget to make sure it would work, he put the key ring receiver on Tidbit's collar and the remote in his pocket. We were in good shape now and we could all enjoy the rest of our family reunion—and I didn't lose my puppy Tidbit again! TIDBITS: Learn more about how to prevent losing your dog. 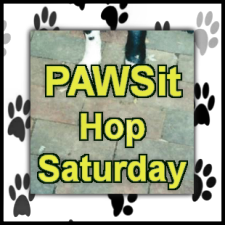 PAWSit Hop Saturday is a blog hop created especially for bloggers who are also dog lovers. Write your own dog stories this week and link them up with us! So that others may find us, be kind and grab the PAWSit Hop Saturday image and link to this article from your blog post.